The potential biofuel plant Jatropha curcas L. is affected by larvae of Archips micaceanus (Walker), a moth of the family Tortricidae. The hybrid Bacillus thuringiensis (Bt) δ-endotoxin protein Cry1Ab/1Ac confers resistance to lepidopteran insects in transgenic rice. 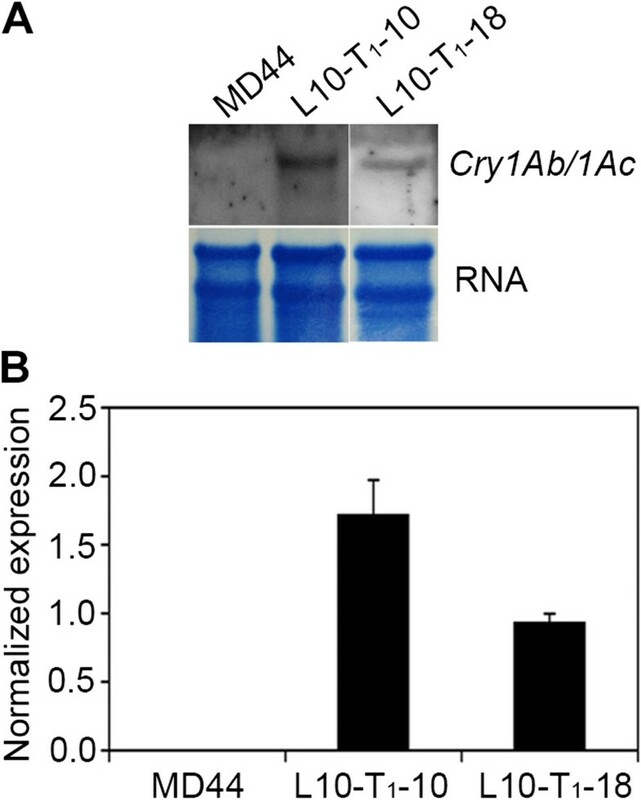 Here, we report the production of a marker-free transgenic line of J. curcas (L10) expressing Cry1Ab/1Ac using Agrobacterium-mediated transformation and a chemically regulated, Cre/loxP-mediated DNA recombination system. L10 carries a single copy of marker-free T-DNA that contains the Cry1Ab/1Ac gene under the control of a maize phosphoenolpyruvate carboxylase gene promoter (P Pepc :Cry1Ab/1Ac:T Nos ). The P Pepc :Cry1Ab/1Ac:T Nos gene was highly expressed in leaves of L10 plants. Insecticidal bioassays using leaf explants of L10 resulted in 80-100% mortality of larvae of A. micaceanus at 4 days after infestation. 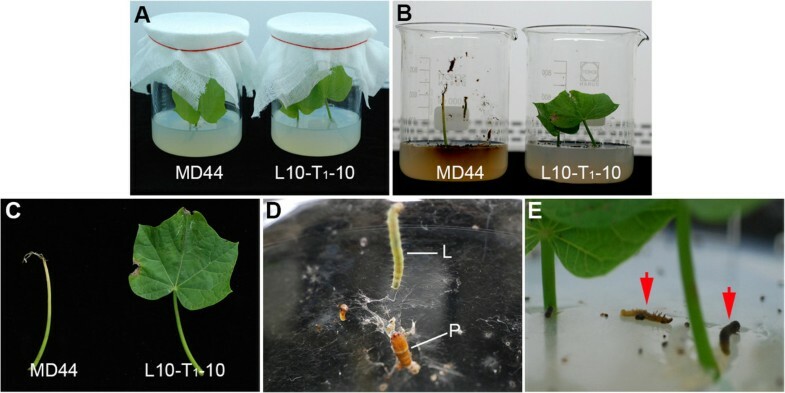 The results demonstrate that the hybrid Bt δ-endotoxin protein Cry1Ab/1Ac expressed in Jatropha curcas displays strong insecticidal activity to A. micaceanus. The marker-free transgenic J. curcas line L10 can be used for breeding of insect resistance to A. micaceanus. The crystalline (Cry) proteins from Bacillus thuringiensis (Bt) have specifically toxic activity against numerous insect species of the orders Lepidoptera, Diptera, Coleoptera, Hymenoptera and nematodes . The Cry proteins are inactive until they get solubilized by proteases in the insect’s midgut at high pH (>9.5), releasing proteins called δ-endotoxins [2, 3]. The δ-endotoxins bind to the midgut receptors, insert into the insect gut cell membrane to form ion channels or pore and cause cellular lysis due to the inflow of ions and water through the pores, which eventually kills the insects [4–6]. The insecticidal activity of the Cry proteins provides an alternative and attractive approach for pest management through the expression of Cry proteins in transgenic plants. Expressions of the cry gene in tobacco and tomato are the first two reports of plants genetically engineered for insect resistance [7, 8]. Since that, different versions of cry genes have been used to generate transgenic crops, such as corn, cotton, potato, tomato, rice and sugarcane . The first Bt-derived insect-resistant transgenic tree was the transgenic poplar (Populus sp.) expressing Cry1A(a) δ-endotoxin, which provided resistance against forest tent caterpillar (Malacosoma disstria) and gypsy moth (Lymantria dispar) [10, 11]. Since that, different versions of cry genes have been transferred into a number of tree species, including walnut (Juglans regia) , European larch (Larix decidua Mill.) , white spruce (Picea glauca) [14, 15], loblolly pine (Pinus taeda L.) , eucalyptus (Eucalyptus camaldulensis)  and hybrid poplar (Populus tremula × Populus tremuloides) . Jatropha curcas L. is a poisonous, semi-evergreen shrub or small tree that belongs to Euphorbiaceae family. J. curcas mainly grows in tropical and subtropical countries. Compared with other plants, J. curcas is a drought-resistant, non-food plant that can grow in marginal lands. J. curcas seeds contain about 25 to 40% storage lipids . In recent years, J. curcas has emerged as a potential biofuel plant. However, like other crops, large plantation of J. curcas is greatly influenced by biotic and abiotic stresses. Despite the presence of toxins such as phorbol ester and curcins in J. curcas leaves and seeds, J. curcas is still attacked by insects [20–24], fungi  and viruses . Archips is a genus of tortrix moths that belong to the family Tortricidae and have over 100 species. The leafrolling larvae of tortrix moths feed on plant leaves, causing damage to crops and trees . Recently, Archips occidentalis (Walsingham) was reported to cause damage on J. curcas plants in Southern Benin . In Southeast Asia, the most common tortrix moth species is Archips micaceanus (Walker) although Archips machlopis (Meyrick) and Archips tabescens (Meyrick) were also found in Malaysia . A. micaceanus, also called soybean leaf-roller, is the only tortrix moth species reported in Singapore . Recently, we found that A. micaceanus could also cause damage to J. curcas (Figure 1). Chemical pesticides are effective against the tortrix moths and larvae; however, they also kill non-target beneficial insects, especially the pollinators for J. curcas . Previously, Bt-derived biological insecticides were used to control tortrix moths Archips argyrospilus (Walker) on apple and pear [30, 31] and Archips rosanus (L.) on filberts . The effectiveness of Bt on the two tortrix moths suggests cry gene may be used to control A. micaceanus on J. curcas plants. Archips micaceanus at larva (A) and adult (B) stages on J. curcas leaves. A hybrid cry gene Cry1Ab/1Ac was previously used to generate transgenic rice in Minghui 63, an indica cytoplasmic male sterile (CMS) restorer line, and its derived hybrid F1 rice Shanyou 63 expressing Cry1Ab/1Ac proteins showed high protection against both leaf-folder (Cnaphalocrocis medinalis) and yellow stem borer (Scirpophaga incertulas) . Recently we produced a marker-free transgenic rice line L24 with the P Pepc :Cry1Ab/1Ac:T Nos gene using Agrobacterium-mediated transformation and a chemically regulated, Cre/loxP-mediated DNA recombination system . The P Pepc :Cry1Ab/1Ac:T Nos gene in L24 was mainly expressed in green tissues such as leaves and stem and provided resistance to rice leaf-folder (C. medinalis) . Here, we report the adoption of similar technology to generate a marker-free transgenic line of J. curcas that expresses Cry1Ab/1Ac proteins for resistance to A. micaceanus. The binary construct pCCreloxPBt, which carries a chemically regulated Cre/loxP system and a hybrid Cry1Ab/1Ac gene driven by maize phosphoenolpyruvate carboxylase (PEPC) gene promoter (P Pepc :Cry1Ab/1Ac:T Nos ), was used to produce marker-free transgenic rice line L24 that specifically expresses the Cry1Ab/1Ac proteins in leaves and stem . Theoretically, the marker (Hpt gene)-containing loxP fragment in T-DNA region of pCCreloxPBt in transgenic plants can be removed by β-estradiol-regulated Cre/loxP-mediated excision, which yields marker-free T-DNA in transgenic plants . The marker-free T-DNA is detected by PCR amplification of P1-P4 fragment (385 bp) flanking the remaining loxP site after DNA recombination, while the marker-containing T-DNAs, T-DNAs that have undergone incomplete loxP fragment excision and truncated T-DNAs are detected by PCR amplification of the P1-P2 (534 bp) fragment flanking the loxP site at the left border of T-DNA and/or the P3-P4 (460 bp) fragment flanking the loxP site adjacent to the maize PEPC gene promoter . In this study, pCCreloxPBt was used to produce transgenic J. curcas plants via Agrobacterium-mediated transformation . After β-estradiol-regulated Cre/loxP-mediated excision of the loxP fragment, a total of twenty putative transgenic T0 plants were obtained. The 20 T0 plants were screened by PCR for the presence of the Cry1Ab/1Ac and Hpt genes as well as for the excision of the loxP fragment, which was detected by the amplification of P1-P4 fragment . All the 20 T0 plants carried the coding region of the Cry1Ab/1Ac gene (Table 1). Only one plant, T0-20, showed PCR amplification of the Cry1Ab/1Ac gene and the P1-P4 fragment, but not the Hpt gene (Table 1). Twelve T0 plants had PCR amplification of both Cry1Ab/1Ac and Hpt genes, but not the P1-P4 fragment, indicating that they carried marker-containing T-DNA only (Table 1). Six T0 plants gave amplification of both Cry1Ab/1Ac and Hpt genes, as well as the P1-P4 fragment (Table 1). These plants should contain multiple copies of T-DNA and at least one copy had undergone loxP fragment excision. In addition, plant T0-1 had PCR amplification of the Cry1Ab/1Ac gene only, but not the Hpt gene or the P1-P4 fragment (Table 1). This plant might carry a truncated T-DNA containing the Cry1Ab/1Ac gene only, which did not result from precise excision of the loxP fragment. 1The primers for detecting the presence of the Cry1Ab/1Ac gene were Bt F1 and Bt R1; 2the primers for detecting the excision of the loxP fragment or the presence of P1-P4 fragment were P1 and P4 ; 3the primers for detecting the presence of the Hpt gene were Hpt F and Hpt910-1; 4binary construct used for transgenic J. curcas production . The expression of the Cry1Ab/1Ac proteins in the 20 T0 plants was detected by western blot analysis. The initial results indicated that only one T0 plant, L10-T0, had Cry1Ab/1Ac expression with the expected molecular size at about 68 kDa; the remaining T0 plants either did not show any expression of the Cry1Ab/1Ac protein or expressed truncated Cry1Ab/1Ac proteins (data not shown). Transgenic L10-T0 was selected for further study, while the other undesirable T0 plants were discarded. L10-T0 had five copies of T-DNA detected by southern blot analysis using the restriction enzyme NcoI, which has cutting sites upstream only of P Pepc :Cry1Ab/1Ac:T Nos , and the Cry1Ab/1Ac gene probe (Figure 2A). The above-mentioned PCR analysis also indicates that L10-T0 contains both marker-free and marker-containing T-DNAs (Table 1). We then performed genetic analysis in order to obtain functional and marker-free transgenic T1 plants that carry the P Pepc :Cry1Ab/1Ac:T Nos gene only. Twenty T1 progeny of L10-T0 were obtained and they were screened by PCR for individuals that contained only marker-free T-DNA (Table 2). Three T1 plants, L10-T1-5, L10-T1-10 and L10-T1-18, showed PCR amplification of the Cry1Ab/1Ac gene and the P1-P4 fragment, but not for P1-P2 and P3-P4 fragment (Table 2 and Figure 3; data for L10-T1-5 are not shown). The results indicate that the three T1 plants have inherited the marker-free T-DNA from L10-T0. L10-T1-10 and L10-T1-18 were selected for further analysis, whereas L10-T1-5 died from pathogen infection. 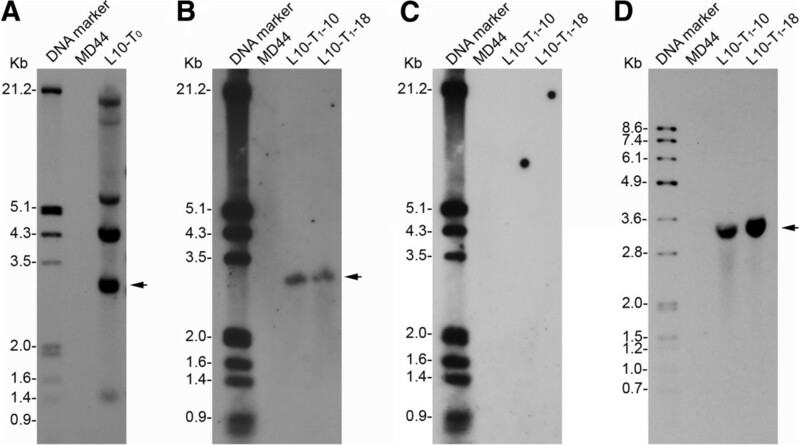 Southern blot analysis indicated that both L10-T1-10 and L10-T1-18 carry one copy of T-DNA, which is the marker-free T-DNA identified by PCR analysis (Figure 2B and C). More importantly, the expected 3.5-kb SphI-KpnI fragment was detected in L10-T1-10 and L10-T1-18 by southern blot analysis using restriction enzymes SphI and KpnI and the Cry1Ab/1Ac probe (Figure 2D), indicating that the two marker-free transgenic plants contain the intact P Pepc :Cry1Ab/1Ac:T Nos gene. For both PCR and southern blot analyses, no signal was detected with non-transgenic MD44 plants (Table 2, Figure 2 and Figure 3). Southern blot analysis of transgenic Cry1Ab/1Ac plants of J. curcas. (A) Detection of T-DNA copy number in transgenic T0 plant L10 (L10-T0). Genomic DNA samples of L10-T0 and cultivar MD44 were digested with restriction enzyme NcoI. The southern blot was hybridized with a DNA probe derived from the Cry1Ab/1Ac gene. Arrow indicates the T-DNA copy that was putative marker-free (see below), which was selected for further study. (B) Transmission of the marker-free T-DNA in the T1 progeny of L10. Southern blot analysis was carried out using the restriction enzyme NcoI and the Cry1Ab/1Ac probe. L10-T1-10 and L10-T1-18 are two individual T1 plants of L10. (C) Detection of Hpt gene in T1 plants L10-T1-10 and L10-T1-18 by southern blot analysis. The same southern blot in (B) was stripped and then re-hybridized with an Hpt gene probe. (D) Detection of the intact P Pepc :Cry1Ab/1Ac:T Nos gene in the marker-free T1 progeny of L10. Genomic DNA samples of L10-T1-10, L10-T1-18 and MD44 were digested with restriction enzymes KpnI and SphI. The southern blot was hybridized with the Cry1Ab/1Ac probe. The expected size of the KpnI-SphI fragment of the P Pepc :Cry1Ab/1Ac:T Nos gene is 3452 bp. 1The primers for detecting the presence of P1-P2 fragment were P1 and P2 ; 2the primers for detecting the presence of P3-P4 fragment were P3 and P4 ; 3the primers for detecting the excision of the loxP fragment or the presence of P1-P4 fragment were P1 and P4 ; 4the primers for detecting the presence of the Hpt gene were Hpt F and Hpt910-1; 5the primers for detecting the presence of the Cry1Ab/1Ac gene were Bt F1 and Bt R1; 6binary construct used for transgenic J. curcas production . Detection of loxP fragment excision by PCR. Genomic DNA samples from the putative marker-free T1 plants L10-T1-10 and L10-T1-18 were amplified by PCR for detection of Cre/loxP-mediated loxP fragment excision using primer pairs P1/P2, P3/P4 and P1/P4 . The presence or absence of the Hpt and Cry1Ab/1Ac genes were also detected by PCR. Plasmid DNA of pCCreloxPBt and genomic DNA from MD44 were used as the controls. Primers are listed in Table 4. The transcripts of the P Pepc :Cry1Ab/1Ac:T Nos gene in L10-T1-10 and L10-T1-18 were detected by northern blot analysis as well as by real-time quantitative reverse transcription PCR (qRT-PCR) (Figure 4A and B). No signal was detected in non-transgenic MD44 plants in either of the two experiments (Figure 4A and B). 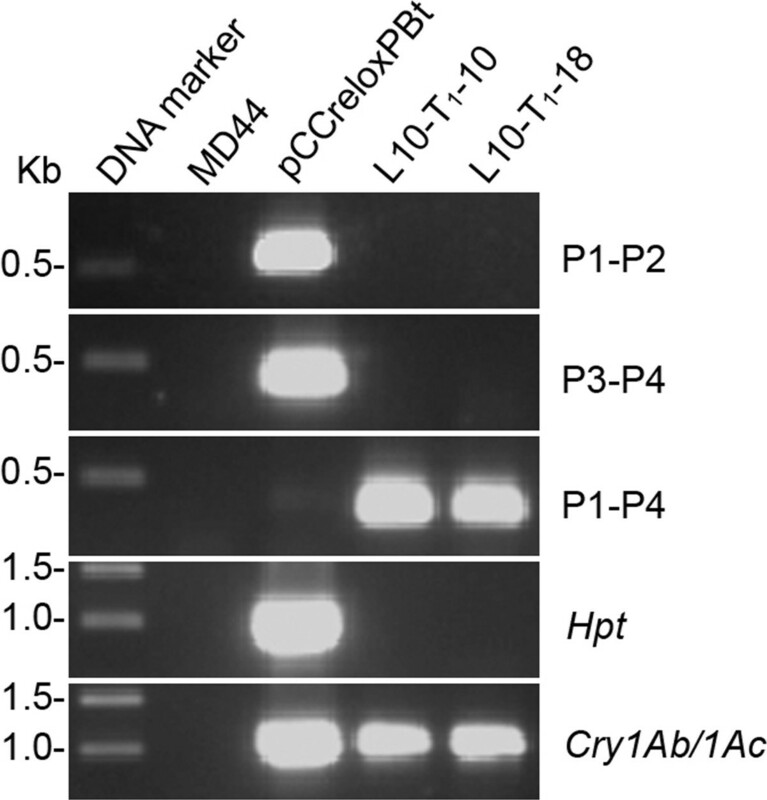 The Cry1Ab/1Ac proteins expressed in transgenic J. curcas plants were detected by western blot analysis and anti-CRY1Ab polyclonal antibodies. 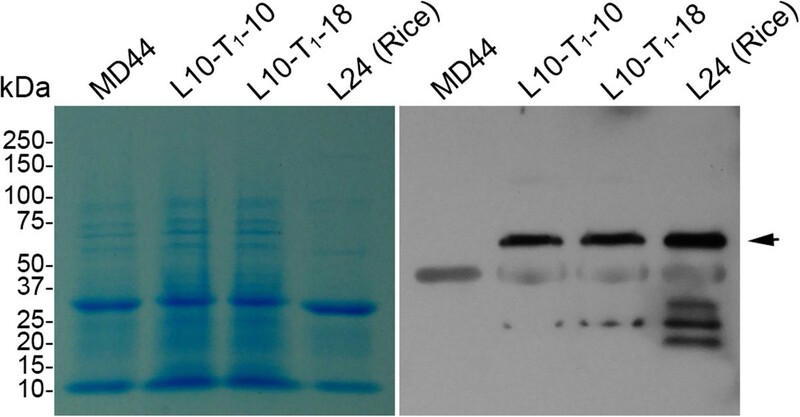 The Cry1Ab/Ac proteins were expressed in L10-T1-10 and L10-T1-18, which had similar molecular size to that of Cry1Ab/1Ac expressed in rice (Figure 5). No Cry1Ab/1Ac signal was detected in non-transgenic MD44 plants (Figure 5). However, a non-specific band with molecular size at about 50 kDa was detected by anti-CRY1Ab polyclonal antibodies in both MD44 and transgenic J. curcas plants (Figure 5). The results demonstrated that the P Pepc :Cry1Ab/Ac:T Nos gene expresses normally in leaf tissues of transgenic J. curcas plants. Expression of the Cry1Ab/1Ac gene in transgenic J. curcas plants. (A) Detection of Cry1Ab/1Ac gene transcripts by northern blot analysis. The upper panel shows the result of northern blot analysis detected by a Cry1Ab/1Ac probe. The lower panel is the image of RNA loading assessed by methylene blue staining. MD44, J. curcas cultivar MD44; L10-T1-10 and L10-T1-18, transgenic T1 plants. (B) Detection of Cry1Ab/1Ac gene transcripts by qRT-PCR. Results are shown as the normalized expression with the expression level of the Cry1Ab/1Ac gene in L10-T1-18 set as 1. The experiments were performed in triplicate and the data are presented as means ± SD. Detection of Cry1Ab/1Ac proteins in transgenic J. curcas plants. The Cry1Ab/1Ac proteins were detected with anti-CRY1Ab polyclonal antibodies. The Cry1Ab/1Ac proteins expressed in L24 of transgenic rice were used as the positive control. The proteins stained with Coomassie blue in duplicate SDS-PAGE gel serve as protein loading controls (left panel). Arrow indicates the position of Cry1Ab/1Ac. MD44, J. curcas cultivar MD44; L10-T1-10 and L10-T1-18, transgenic T1 plants; L24 (Rice), transgenic rice carrying the P Pepc :Cry1Ab/1Ac:T Nos gene . A. micaceanus larvae, at the second to third instar stages, were collected from J. curcas plants grown in an in-house farm and used for insecticidal bioassay. The larvae were fed with leaf explants from MD44 or L10-T1-10 (Figure 6A). After 4 days of infestation, the larvae feeding on non-transgenic MD44 completely ate up the two leaf explants in each beaker, whereas the larvae feeding on L10-T1-10 caused little damage to the leaf explants (Figure 6B and C). In total, 14 of the 15 A. micaceanus larvae feeding on MD44 in the three repeated experiments remained alive and healthy, and one larva in experiment I transformed into a pupa, which might be due to the third instar larvae used for this experiment (Figure 6D; Table 3). On the contrary, 14 of the 15 A. micaceanus larvae feeding on L10-T1-10 died at 2 to 3 days after infestation (Figure 6E; Table 3). Only one larva survived and transformed into a pupa after feeding on L10-T1-10 in experiment I (Table 3). The larvae mortality in explants of transgenic J. curcas ranged from 80 to 100% in the three repeated experiments (Table 3). The bioassay results clearly demonstrated that the Cry1Ab/1Ac proteins expressed in transgenic J. curcas have strong insecticide activity against A. micaceanus larvae. Bioassay on insecticidal activity of Cry1Ab/1Ac in transgenic J. curcas plants against A. micaceanus. (A, B) Leaf explants from MD44 and transgenic Cry1Ab/1Ac plant L10-T1-10 artificially infested with the second to third instar larvae of A. micaceanus in beakers. Photos were taken at 0 day (A) and 4 days (B) after infestation, respectively. (C) Feeding damage on leaves of MD44 and L10-T1-10 by A. micaceanus larvae. Photos were taken at 4 days after infestation. (D) Live larva and pupa of A. micaceanus after feeding on leaves of MD44 at 4 days after infestation. L, Larva; P, pupa. (E) Death of larvae of A. micaceanus after feeding on leaves of L10-T1-10 at 4 days after infestation. Arrows indicate two dead larvae. 1Viability and mortality of insects were scored at 4 days after infestation. Using Agrobacterium-mediated transformation and a chemically regulated, Cre/loxP-mediated DNA recombination system, we have obtained one transgenic J. curcas line that contains a single copy of the P Pepc :Cry1Ab/1Ac:T Nos gene within a marker-free T-DNA. Twenty T0 plants were produced in this study but one marker-free line was obtained. The efficiency of obtaining a marker-free transgenic line was only 5%. The major reason for the low efficiency in obtaining marker-free transgenic line may be due to the inefficient excision of the loxP fragment in the T-DNA after β-estradiol induction, which occurred in 7 of the 20 T0 plants obtained (Table 1). In this study, the β-estradiol induction was applied on the hygromycin-resistant shoots rather than on the hygromycin-resistant calli in order to obtain as many transgenic plants as possible. In this case, the β-estradiol might not be able to uniformly and efficiently access all types of cells, especially the germline cells in the regenerated shoots. Further study may be required to test the introduction of β-estradiol induction on the hygromycin-resistant calli rather than the hygromycin-resistant shoots. Another reason could be the result of incomplete loxP fragment excision from T-DNA in transgenic plants that contain multiple copies of T-DNA. In this study, the two marker-free T1 plants, L10-T1-10 and L10-T1-18, were obtained from T1 progeny of L10-T0, which contained at least five copies of T-DNA. Finally, truncated T-DNA integration containing only one loxP site may make it impossible to perform Cre/loxP-mediated DNA recombination, which further reduces the efficiency of obtaining marker-free transgenic plants. Incomplete loxP fragment excision may be unavoidable due to the common presence of multiple T-DNA insertion and truncated T-DNA integration [34, 36, 37]. Nevertheless, the marker-free transgenic J. curcas plants generated in this study reduce the biosafety concerns of the marker gene on the environments. Due to the presence of toxins such as phorbol ester and curcin in seeds, the storage lipids from J. curcas seeds are mainly used as biofuel or in other industrial applications rather than as human food or animal feed. The Bt δ-endotoxin, as an effective biological insecticide, has been successfully used for generation of transgenic plants for insect resistance in both crops and trees. Therefore, the utilization of the cry gene in developing transgenic J. curcas for insect resistance is an ideal method for insect control and will unlikely give rise to biosafety concern in the food chain of human beings. In this study, the Cry1Ab/1Ac proteins produced in transgenic J.curcas plants had strong insecticidal activity to A. micaceanus larvae. Previously, the hybrid Cry protein expressed in transgenic rice showed strong larvicidal activity that kills lepidopteran pests, the most serious of which include the yellow stem borer (S. incertulas), the striped stem borer (Chilo suppressalis) and rice leaffolder (C. medinalis) [33, 34, 38]. The Cry proteins from Bt have been found to show specifically toxic activity against numerous insect species of the orders Lepidoptera, Diptera, Coleoptera, Hymenoptera and nematodes . It was reported that there are six families of Coleoptera and three families of Lepidoptera that can attack J. curcas plants . Therefore, in the future it is worth testing whether the transgenic J. curcas generated in this study can provide insecticidal activity for these insects of J. curcas. We have produced one marker-free transgenic J. curcas line that carries a single copy of the P Pepc :Cry1Ab/1Ac:T Nos gene. The Cry1Ab/1Ac proteins expressed in the transgenic J. curcas line provide high resistance to A. micaceanus larvae. The marker-free transgenic line, designed as L10 for further study, can be used for J. curcas breeding for insect resistance to A. micaceanus and probably for other Bt δ-endotoxin-sensitive insects on J. curcas plants. J. curcas L. cv. MD44 was used for J. curcas transformation. MD44 and transgenic J. curcas plants were grown in the greenhouse under natural climate conditions at a temperature of 30 to 32°C for 12.5 h (light) and 24 to 26°C for 11.5 h (dark). The binary construct pCCreloxPBt  was used for MD44 transformation. pCCreloxPBt carries a P Pepc :Cry1Ab/1Ac:T Nos gene and a chemically regulated Cre/loxP system for the excision of the selection marker gene . Agrobacterium-mediated transformation of J. curcas was carried out according to the method described previously . In brief, the cotyledon discs at the size of 0.3 × 0.3 cm2 were co-cultivated with Agrobacterium tumefaciens strains AGL1 harboring pCCreloxPBt on co-cultivation medium  for 2 to 3 days at 22°C in darkness. The co-cultivated cotyledon discs were rinsed thoroughly with sterile water and then with suspension medium containing 300 mg/L cefotaxime . Cotyledon discs were cultured on callus formation medium  at 25°C in darkness for 3 weeks. The cotyledon discs carrying newly emerged hygromycin-resistant calli were transferred onto shoot regeneration medium I  and cultured for 3 weeks at 25°C under 16-h light/8-h dark cycles. The regenerated shoots were sub-cultured on shoot regeneration medium II . The hygromycin-resistant shoots at about 2 to 3 mm were transferred onto β-estradiol induction medium without hygromycin  to induce marker excision. After 2 weeks, the β-estradiol-treated shoots were transferred back to the shoot regeneration medium II without hygromycin . After 4 weeks, the regenerated shoots were transferred onto shoot elongation medium  for elongation and bud multiplication. The elongated shoots at about 2.5-cm length were rooted on rooting medium . The putative transgenic plants with a healthy root system were eventually transplanted into soil-filled pots in the greenhouse. PCR analysis for the presence of transgenes as well as Cre/loxP-mediated DNA recombination in transgenic plants was carried out according to the methods described previously . The PCR primers used in this study are listed in Table 4. J. curcas genomic DNA was isolated from leaf tissues as described previously . About 2 μg of DNA was digested with proper restriction enzymes, separated on 0.8% agarose gel and then blotted to Hybond™-N+ nylon membrane (Amersham Biosciences, Little Chalfont, Buckinghamshire, UK). Southern blots were hybridized with DIG-labelled DNA probes for Cry1Ab/1Ac and hygromycin phosphotransferase gene (Hpt), respectively, according to standard procedures. The primer pairs for amplification of DNA probes were Bt F1/Bt R1 for the Cry1Ab/1Ac gene and Hpt F/Hpt910-1 for the Hpt gene, respectively (Table 4). Total RNA was isolated from leaf tissues of J. curcas using the methods described previously . About 10 μg total RNA was fractionated on a 1.2% formaldehyde agarose gel and blotted onto a Hybond™ N+ membrane (Amersham Biosciences). The northern blot hybridization and the labeling of the Cry1Ab/1Ac gene probe were similar to the methods described for the southern blot analysis. qRT-PCR was carried out according to the method described previously with minor modification . The first strand cDNA was synthesized using iScript cDNA synthesis kit (Bio-Rad, Hercules, CA, USA). PCR reaction (15 μl) was conducted on a CFX96 real-time system containing 2 μl first strand cDNA templates, 1 × SsoFast EvaGreen supermix (Bio-Rad) and 500 nM forward primer Bt F2 and reverse primer Bt R2 (Table 4). The actin gene 1 (JcActin1) of J. curcas was used as control. The primer pair for the Cry1Ab/1Ac gene was Bt F2/Bt R2, and the primer pair for the JcActin1 gene was JcActin F1/JcActin R1 (Table 4). Total proteins were extracted from J. curcas leaves with a homogenization buffer (0.1 M Tris-HCl, pH8.0, 0.01 M MgCl2, 18% (w/v) sucrose, 40 mM β-mercaptoethanol). Total protein concentration was determined with the Bradford method . About 10 μg of each protein sample was separated on an 8% SDS-PAGE, followed by blotting onto polyvinylidene fluoride (PVDF) membranes (Bio-Rad). The Cry1Ab/1Ac proteins from the rice line L24, a marker-free transgenic line carrying the P Pepc :Cry1Ab/1Ac:T Nos gene , served as the positive control. Cry1Ab/1Ac proteins were detected with anti-CRY1Ab polyclonal antibodies (Abcam, Cambridge, UK) and horseradish peroxidase-coupled secondary antibodies (Bio-Rad). A beaker method was utilized to check if the Cry1Ab/1Ac proteins expressed in the transgenic J. curcas plants had insecticidal activity towards A. micaceanus larvae. Leaf explants from transgenic J. curcas plants or non-transgenic MD44 plants were sterilized and put on 1% Agar medium in beakers. Five, second to third instar A. micaceanus larvae, collected from J. curcas plants grown in an inhouse farm were fed onto J. curcas leaves. The beakers were sealed with cheese cloth to prevent the larvae from escaping. The feeding assay was conducted in a growth chamber at a temperature of 28°C, relative humidity of 80% and photoperiod of 12 h. Damage on leaf tissues and the larval mortality were observed and photographed at 4 days after infestation. The experiment was repeated three times and the results are representative of each independently conducted experiment. GK is a Research Fellow, MH is a Senior Research Officer and YZ is the Head of the laboratory and an Associate Director of the Institute’s Strategic Research Program at the Temasek Life Sciences Laboratory, 1 Research Link, NUS, Singapore 117604 and an Adjunct Assistant Professor of the Department of Biological Sciences, 14 Science Drive, National University of Singapore, Singapore 117543, Republic of Singapore. real-time quantitative reverse transcription PCR. The authors thank Yan Hong and Chengxin Yi for providing seeds of J. curcas cultivar MD44 and Chengxin Yi and Shilu Zhang for their assistance with bioassay. This work was supported by Singapore Economy Development Board (EDB) and Joil Pte Ltd, Singapore. YZ and GK designed the experiments. GK and MH conducted the experiments. GK and YZ analyzed the data and wrote the article. All the authors have read and approved the final manuscript.